Put the PHP-File in your UTW-Plugin-Directory and activate it. Go to the Manage-Menu and find „ReTag" next to the UTW-Tag-Menu. Note: This Extension needs UTW to run of course. I worked on an alternative tag-cloud which uses checkboxes to combine checked and unchecked tags in one view. But there is a problem with adding new tags. The default UTW-Add-Tags-Ajax-Thing will probably cause errors in combination with the checkbox-cloud. See uncommented code as well. This is the 0.11-Release so please have a close look if you find any error. There are quite some things that should be optimized. Please help to improve this extension and send your code via eMail. Are the posts in the right order (newest first). How to change the DB-Call? Does the „related tags"-Line work for you? * Description: Extention for UTW2 that allows you to edit the tags of multiple post at the same time. Based on Christine Davis UTW. Cannot tell you at the moment? Do you have the latetest UTW up and running? And an current WP (2.0.2+)? As far as I remember I use the UTW-Include-PHP to do the includes so this should be fine. Would have to look closer with these information. Re Dave's problem: make sure you have installed the ReTag plugin in the UTW directory; I had it one level up („wp-content/plugins/") and got the same error. ReTag Post-Extension for UTW Note for german readers: Zielgruppengerecht ist dieses Post ausnahmsweise in englisch. 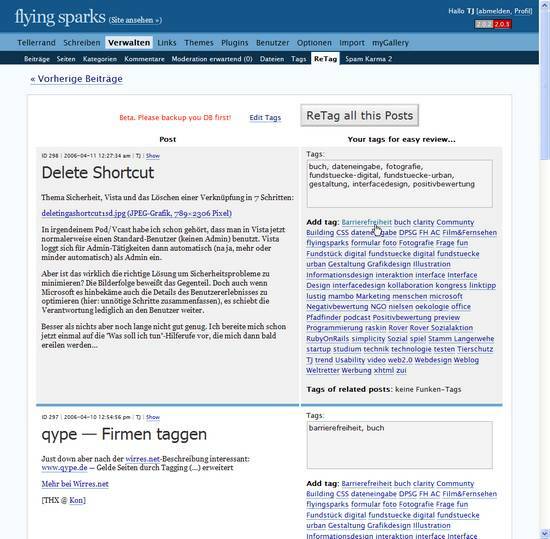 I use the Ultimate Tag Warrior-Plugin for WordPress here at flyingsparks and at pfadiblog.de and its a great tool! @Marius: this will solve your problem! First i have to say I really appreciated the convenience offered by your fine plugin. It made tagging so much easier. Unfortunately, once I upgraded to WordPress 2.1, the plugin no longer functioned and I had to deactivate it. In short, the ‚Re-Tag' page under the ‚Manage Menu' only would show the first page of recent posts and the ‚Previous Entries' does not work. Although the link URL indicates that it's linking to the next set of pages, it still only returns the first page of posts. I tried to include the returned URL's in this comment before but the comment was rejected, apparently for that reason. I really miss the features of this great plugin so if you ever get a chance to test it out in WordPress 2.1 and come up with a workaround, that would be great. I do not know how to code per say but I have no problem following instructions and hacking the code. Don't work with wordpresss 2.1. Why? Hi Sergio, sorry, didnt test it with 2.1 yet. There will be a version for 2.1… but it'll take some time! Update: This Plugin is not updated anymore. Please read the note at the top of the post! //Edit: URL entfernt, SEO Spam? Sorry!